Edwardsburg is a village in Cass County, northeast of South Bend. The population was 1,259 at the 2010 census. 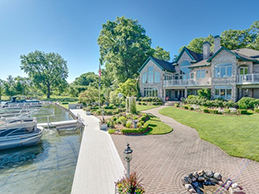 It is part of the South Bend–Mishawaka, IN-MI, metropolitan area, often referred to as “Michiana.” Because of it’s excellent schools and three beautiful lakes it has become a bedroom community for people who work in either Elkhart or South Bend, Indiana. K-12 Education needs are met by Edwardsburg Public Schools. The district is composed of 5 school buildings, a Performing Arts Center, and numerous athletic fields. In addition to athletics, Edwardsburg also boasts a flight III Marching Band. Edwardsburg is situated at the crossroads of M-62, and US 12. The Canadian National railroad tracks run through the village. The village is serviced by the Niles Amtrak Station, and the South Bend Regional Airport,both of which are in the greater Michiana area. The Indiana Toll Road, runs East-West three miles South of the village.